I have not reported in for a while because we are all still in Grenada! Like everyone we have had the odd squall from associated waves but very good weather generally. 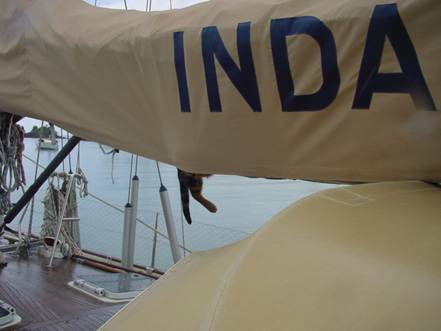 The cats on our yacht tend to lie under the fans during the mid day heat. There is lots of exciting re-development here and much renewed hope for this island following terible IVAN. I wish the same for New Orleans. 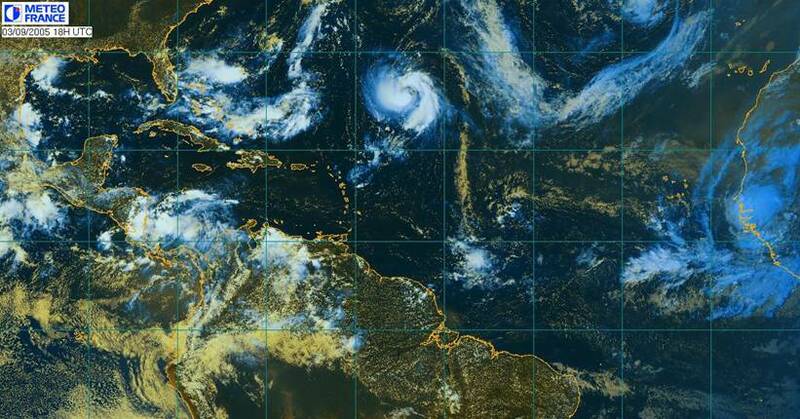 August has been a lucky month for the Caribbean islands. CAT NAPPING AND COOLING THE FEET IN THE RAIN! The prefecture in Guadeloupe has issued a strong wind warning and flash flood alert for Guadeloupe this evening (Sunday 7th) You can see the weather area approaching us on the chart. - GOOD IMAGE OF THE RELEVANT AREAS. Greetings Storm Watchers! I have not posted since July 13th because Ann Louise and I have been sailing down islands again. We passed through virtually every island from Guadeloupe to Grenada and saw some of the damage caused by the winds in the south this season. I feel for the people of that area where their delicate infrastructure has been disrupted again. It was heartening to meet and chat to many of the sailing and cruising folk who survived EMILY in the mangroves and it is significant that so many yachts survived a Cat 1 hurricane without any significant damage in Tyrell Bay. There were nearly 200 yachts in there and the charter companies acted extremely well, flying guests away before the storm hit, whilst their professional staff secured the yachts well in advance. 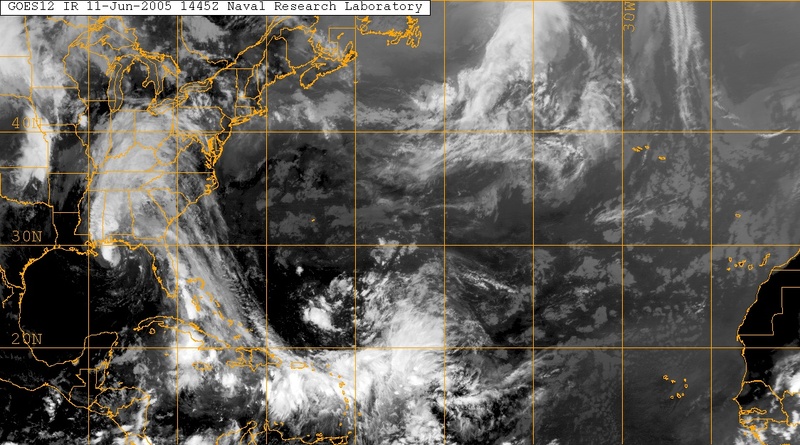 Everyone in that area seems to be well tuned in (regarding hurricane preparedness) and the storm preparation in the shipyards in Grenada is excellent this year. I was actually in Guadeloupe during EMILY which, in the early stages, was predicted to pass directly through the southern tip of Basse Terre. I cannot tell you how surprised I was to see that many yachts here in Pointe a Pitre were left totally unprepared and some left completely unattended (these with huge biminis up with sails still bent on). I do hope the owners of these boats are weather gurus and knew that EMILY would pass us by. We took no such chances – as normal we prepared our yachts for a blow just in case. We are beginning to hope in Guadeloupe that Emily has excused us and entreat that she treads lightly on our Caribbean colleagues who lie in her path. I point out to everyone the next area of concern. See attachment. We are beginning to hope in Guadeloupe that Emily has excused us and entreat that she treads lightly on our Caribbean colleagues who lie in her path. I point out to everyone the next area of concern. I trust everyone has fully noted Tropical Depression 5. Hurricane Centre Miami is now issuing advisories. 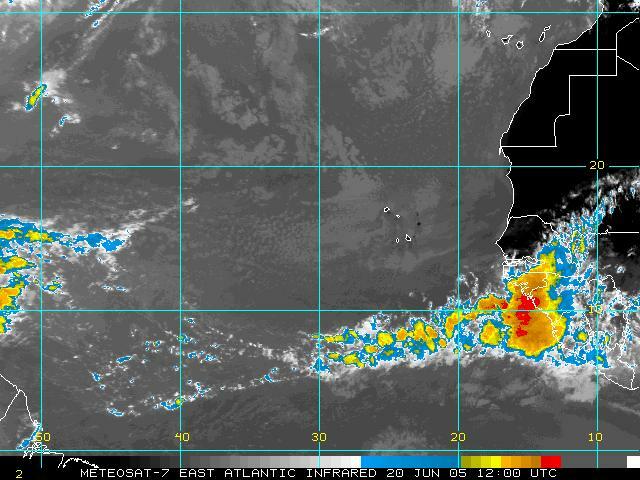 I have monitored the vigorous wave associated with this low and the whole system is looking favourable for formation. 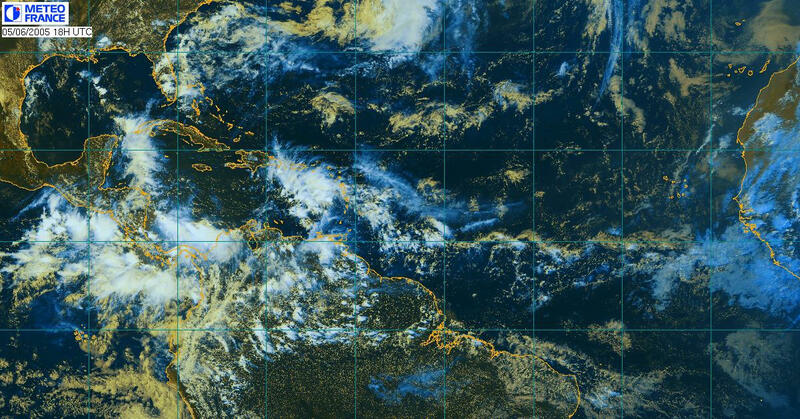 Everyone from Guadeloupe down to Trinidad should be keeping a Weatherly Eye on this developing system, currently near 42West 10North. Ho hum here we go! I have been sailing down islands hence no recent postings. I was heading towards Grenada last week when Hurricane Dennis gathered itself - so spent 3 days hiding in Marigot Bay, St Lucia, instead. 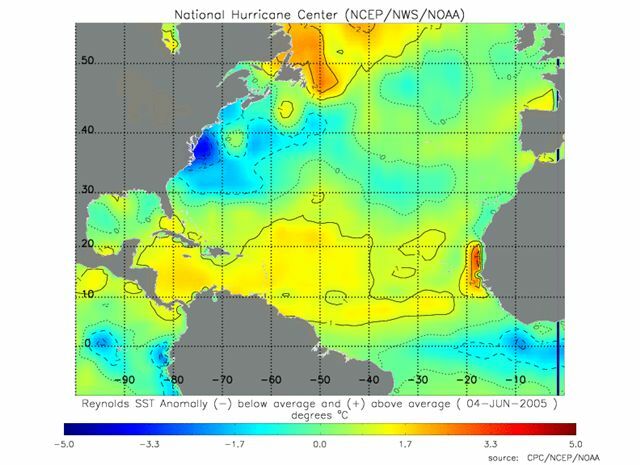 I am now back in Guadeloupe and looking closely at this wave approaching us. 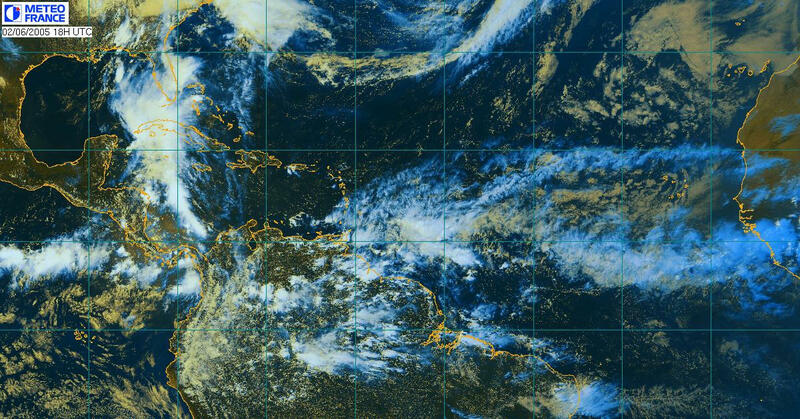 Its 1400 miles out and there are favourable conditions for development it seems. The hurricanes are gathering early no? - STORM WATCH ON AFRICAN COAST! This is one we are wathching with interest! Hope it just cools the sea! - SEE CARIBBEAN FEEDING ARLENE! THIS TELLS IT ALL! Our latest radar image showing the rain now heading away. Hey! Looked out and its stopped raining and got brighter! Torrential rain with thunder and impressive lightening here! 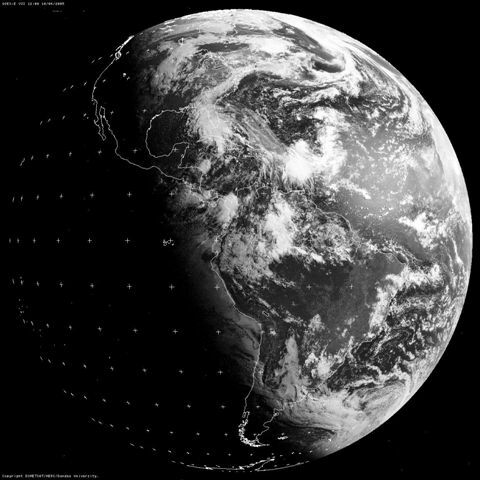 I enclose this picture of ur world which tells the whole stry - see ARLENE to the North and look at the big cloud over Guadeloupe and the Leewards! Apologies this is the image missing! - HOT WATER HELPS CREATE CYCLONES? 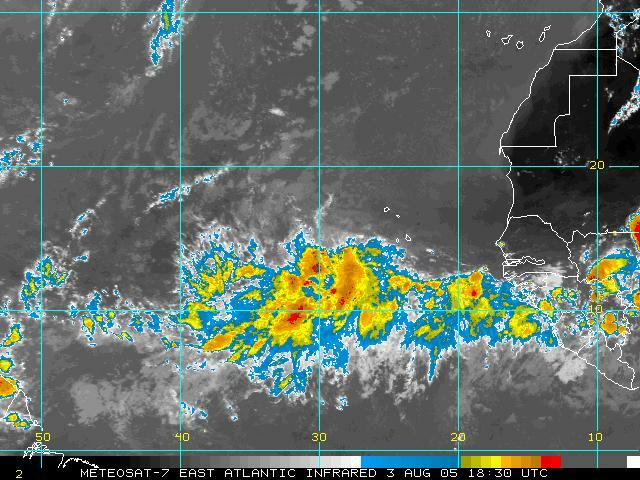 The hot area near Africa is just one of the factors believed to influence cyclone development - but as previous posting this latest image even further indicates the extent of the above normal condition, particularly off Africa. 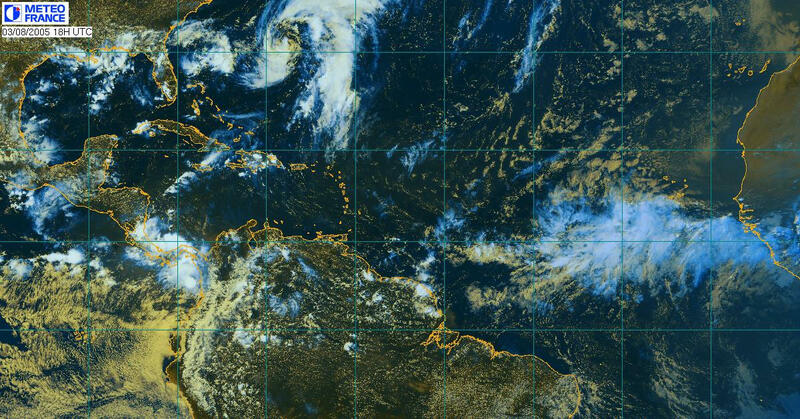 You can also see Guadeloupe is right on a hot spot as well – hopefully it will cool with this rain we are having! 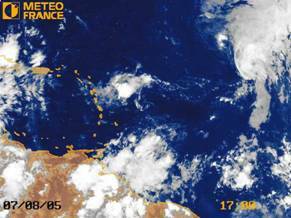 - Wind NORTH WEST of Guadeloupe. Happy Monday to fellow weather watchers! week-end in Guadeloupe - not as much wind as it could have been though. The strong winds were/are on our west coast and up towards Montserrat. - Week -end wind in Guadeloupe. For 4 – 5 days an approaching TROF/LO has featured in many forecasts - this has persisted and is now centred 16N / 65W - there are even more significant and well formed squalls lying 55W to 45W near 10N. (Up to 50 kts are predicted in these squalls, but they are still well out to sea) The TROF will be near/over Leewards Sun 5th / Mon 6th and there is a suggestion or possibility (or 1 in 10 chance) that a closed LO will form. If the TROF forms we would expect up to 45 kts gusts here in Guadeloupe. If theTROF fails to form or collapses weakly, winds may still be light E to ENE as expected. Anyone who sees steady light SE wind will certainly be safely south of any formed TROF/LO. This link shows why my watermaker is working well (see earlier correspondence). The sea looks kinda warm off Africa no? - Very good definition ATLANTIC jpeg. We have yachts crossing very late this year and this is the tracking photo we use for the French Captains at sea. Nice clarity. Greetings from a new correspondent in Guadeloupe! This hurricane season I shall be monitoring and reporting on the conditions around Guadeloupe - in particular I will cover the harbour around Pointe a Pitre where I live on a 53ft cruising yacht. Let’s hope there is not too much to report! After a period of convection activity with thunderstorms over Basse Terre, particularly over the Soufriere hills, conditions here have now returned to a normal easterly trade pattern, (E and NE 18-20kts). These winds would have better suited yachts participating in Le Tour de Guadeloupe last week where, other than on the north coast, a lighter patch of intermittent and fickle southerly weather persisted through to the weekend – we had inconsistent wind direction, rain squalls, periods of overcast skies and humid conditions. Happily blue skies and puffy white clouds are back so a visit to Les Saintes for the weekend looks promising! By the weekend we also anticipate lighter ENE and NE wind which will suit our boats heading up towards the BVI for some late season charters. Without much wind this season the sea has been so warm - recently my watermaker has broken all records, producing over 110 litres per hour! In the UK it rated at 70 litres per hour! It’s comforting to see that none of the recent Atlantic wave patterns monitored have developed into anything serious so far. Most strong wind patterns seemed to have stayed further South or North of Guadeloupe this year other than a short northerly biased blast in late February - we had some very interesting earth tremors at the same time which rather upset the electrical supply in the marina!